Industrial Design Produces Ergonomic Instruments. 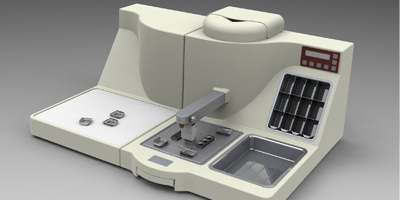 A company was looking for a new tissue embedder and cryo system with unique features and capabilities. When Sigma Design Company took on the job they got all of that in a sleek and user-friendly design. Using photo realistic imaging and paraffin flow modeling in SolidWorks™, the designers analyzed various layouts and the human factors. These variables were meticulously checked in 3D prior to prototyping. All prototyping housing components were made in-house using Sigma’s 3D FDM printer. Concept Development, Photo Realistic Simulation, Detail Design, Electronics, Product Development, Prototype Manufacturing & Testing.